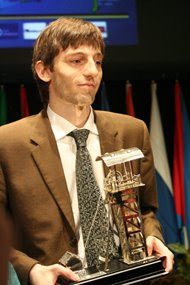 Capman Chess Blog Capman Chess Blog: Alexander Grischuk win XXVI SuperGM, Linares. Alexander Grischuk win this tournament due to better tie break than Ivanchuk. The 1st tie-break was the head-to-head score, but equal because both games between them were drawn, the second tie-break of most wins and has better tie break than Ivanchuk (Grischuk (he won 3 compared to Ivanchuk's 2).Alexander Grischuk join this tournament as a reserve to fill Veselin Topalov place when his delayed match with Gata Kamsky clashed with Linares.